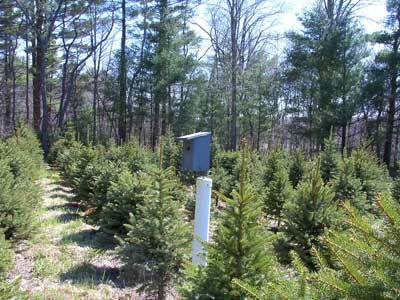 Location: NE Connecticut, in a Christmas tree farm surrounded by a small stream, wetlands and mixed hardwood/coniferous forest. Box: NABS style, small floor (4x4?). 1.5" hole with metal hole guard over entrance. Wobbling PVC predator guard. 5 feet off ground on metal pole. No large overhanging trees. 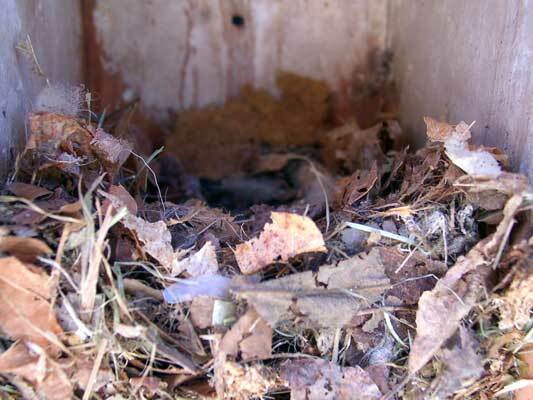 Other cavity nesters in area: flying squirrels, white breasted nuthatch, downy and hairy woodpeckers. Nest started on bare wood with dried leaves that looked like they had been crumpled and then uncrumpled (something titmice do?) and a mini-piece of plastic. Nest is ~2 inches deep, with something of a depression in the center. Construction began on 4/22. 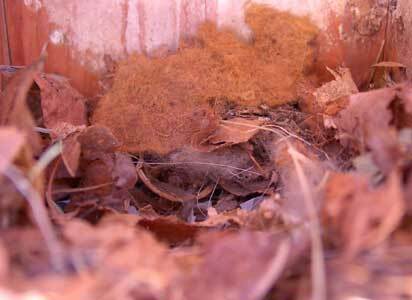 Nest contains dried broken up leaves (maybe 90%), some grass (no seed heads), several bits of plastic and small pieces of paper, and white fur and hair. Not very neat or compact. No clear "layers." No wood chips, or things that look like strips of bark. I didn't notice any feathers. Nest also contains item (center back of photo) I couldn't identify - cardboardy/fibrous looking pieces. Other than that, nothing that looked like bark. No moss. No droppings seen. Very little hair/fur. Small cup in center. Majority of nest (more than 80%?) is made of dried, broken up leaves. The other TUTI nests I have seen within a mile or two of this nest were more compact, and had more "layers" and moss in them, but that might be because there was more moss in the area. On 5/8, still no eggs, but a tiny piece of snakeskin and some black fur. What the heck made this? ANSWER: TUTI. 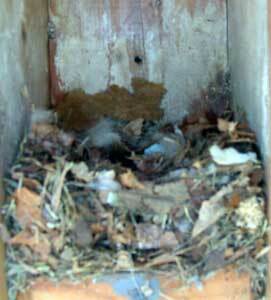 On 5/10 I saw one in the box peering at me through the entrance hole. It hissed and pecked the box a few times and then hunched down, so I didn't disturb it futher. I think the contents depend a lot on what materials are available in the immediate vicinity. On 5/11 I returned in the afternoon and found 6 TUTI eggs in a deep cup. Not an ounce of moss visible. See interesting VIDEO CLIP of titmouse hissing when box was approached and when opened.